1. You (almost) exclusively teach OT history (Genesis, Josh-Kings) at CCBCY (Calvary Chapel Bible College York). What first sparked your interest in the Old Testament? When I was doing my undergraduate degree in biblical studies, a man by the name of Gerald Vinther came to teach during my junior and senior years at the bible college I was attending. He taught OT and the Hebrew language. His classes totally revolutionized my view of God and of the OT. Whether looking at Genesis or the Prophets, he demonstrated the consistency of God’s character between the Old and New Testaments. I discovered a God of grace and love in the OT who desired to have a relationship with His people, just like the God of the NT. My particular church tradition had emphasized the judgmental nature of the God of the OT and de-emphasized the significance of the OT. When we saw the character of God revealed in the pages of the OT, one of my classmates described it as being born-again…again! Since then I have fallen in love with the study of the OT and the God revealed in its pages. Because many Christians don’t know the OT and often have misconceptions about it, and the God revealed in its pages, I have found great joy in assisting others in seeing its beauty and truth, much like I was introduced to it years ago. By the way, this is why I give a special “thank you” in the preface of Family Portraits to Gerald Vinther, and also to my graduate professor in OT, John T. Willis who also had an important influence on me. 2. For as long as I’ve known you, you have been working on this book. What drove you to write Family Portraits? I was drawn to the books of Samuel in graduate school and have continued to study them for many years. One of the things I noticed in my study was the theme of family and the prominence of four families within 1&2 Samuel (Samuel’s, Eli’s, Saul’s, and David’s). None of the studies or commentaries I have read bring out the significance of this particular theme. 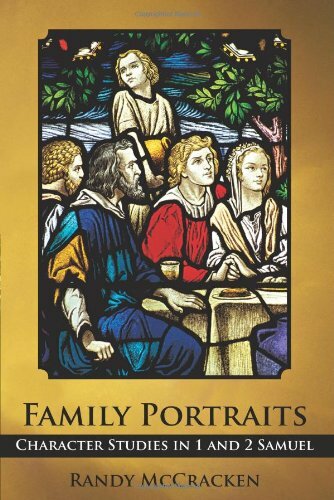 Also, although many character studies have been done on David, Saul, and Samuel, few have been done on the other members of their family, and no book has sought to tackle them all as I do in Family Portraits. I was also intrigued by the fact that character studies, if done correctly, can assist the student of 1&2 Samuel in understanding its characters in a way that a commentary approach can’t. The sustained reflection on a certain character, noting all the places where they appear in the text, often reveals insights that can be overlooked in a commentary. This approach actually modified my understanding of certain characters like Abner and Joab. 3. This is a book of character studies in 1&2 Samuel, yet surprisingly you have omitted sections on Samuel, Saul, and David. What can we learn from investigating the supporting cast in this story? As I mentioned in the last question, a number of studies have been done on these three major characters, but very little has been done on other members of the “supporting cast”. 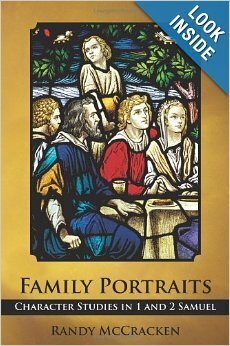 In the Preface to Family Portraits, I compare character studies with an artist who paints a portrait. Although the artist may seek to focus attention on a certain person or object within the painting in order to convey his or her message, the person or object is enhanced by everything else in the painting, which might include various colors, shapes, objects, or people. Leonardo da Vinci’s painting, The Last Supper, is an example of this. While Christ is the focal point of the painting, the expressions and actions of the 12 disciples surrounding him add depth and detail to the portrait and meaning of the painting. One of the techniques that the author(s) of 1&2 Samuel uses is contrasting various characters with other characters. For example, Hannah is contrasted with Peninnah as well as Eli. Samuel is contrasted with Eli and his sons. Jonathan is contrasted with Saul, and David is contrasted with Saul and Absalom. These are only a few examples of the many comparisons and contrasts made between characters in 1&2 Samuel. By studying the lesser known characters and their interaction with God and the major characters, we are able to discern some of the important messages that the author(s) was seeking to convey to his readers. 4. Family Portraits is unique because it incorporates both academic and devotional material in one place. Who did you have in mind when writing this book? First let me say that I believe it is extremely important to combine an academic and devotional approach (by which I mean making practical application to our daily lives). I am glad to see that this approach is beginning to catch on in evangelical circles. Far too often books are either academic in nature with no application, or devotional with no solid scholarly foundation. The academic approach runs the risk of being irrelevant and a pursuit of knowledge for the sake of knowledge, while at the same time making the Bible appear irrelevant to a modern reader. The devotional/applicational approach can run the risk of a passage meaning whatever a particular author wants or thinks it means, if not backed up with solid research and exegesis. To answer your question more directly, Family Portraits is written for the pastor, teacher, Bible College or seminary student, and Christian who is interested in a more in-depth treatment of 1&2 Samuel. While some pastors and Bible college students may be familiar with Hebrew and some of the more technical aspects of Bible study, I have tried to be aware of those who don’t have this expertise. I seek to explain unfamiliar terms and methods and refer to the Hebrew only when it illuminates an important point in the text. Admittedly this can, at times, be a delicate balancing act. Part of my desire is to introduce ideas and methods that the average layperson is unfamiliar with, in hopes that they will be challenged to go to the next level in their own study of the Bible. 5. What do you hope your readers will take away from Family Portraits? First, and foremost, I hope that Family Portraits helps people to develop a closer relationship with, and greater understanding of, the God of the Bible. Character studies are an excellent vehicle for helping us to see ourselves and how the Word of God applies to our lives. In the characters of 1&2 Samuel we find traits that we admire and abhor, and hopefully learning (or being reminded of) these truths causes us to examine our own lives and seek God’s help in becoming the people He desires us to be. Second, there are a lot of great books that deal with various aspects of 1&2 Samuel that the average Christian layperson will never to exposed to. In fact, the average layperson may never even know that these resources exist! Some of these Bible study methods and scholars provide wonderful insights into God’s Word. I hope that Family Portraits, in some small way, introduces them to these resources and scholars and encourages them to pursue a deeper study of the Scripture. Finally, I am hopeful that Family Portraits helps to provide a model for studying Scripture with an academic rigor, but at the same time, with a pastoral heart. As I mentioned in the previous question, and also emphasize in my Preface and Introduction, I believe it is imperative that academic research and devotional application go together. Having said this, I admit my own inadequacy in combining these approaches and don’t pretend to have achieved complete success. I certainly need to continue to grow in both of these areas. Yet it is my hope that Family Portraits is at least an attempt that demonstrates the fruitfulness of this kind of approach. To purchase a copy of Family Portraits click here.